In this authoritative and comprehensive book, two of today's most insightful economists reveal how our beliefs shape financial markets, lead to expansions of credit and leverage, and expose the economy to major risks. The collapse of Lehman Brothers in September 2008 caught markets and regulators by surprise. Although the government rushed to rescue other financial institutions from a similar fate after Lehman, it could not prevent the deepest recession in postwar history. A Crisis of Beliefs makes us rethink the financial crisis and the nature of economic risk. In this authoritative and comprehensive book, two of today's most insightful economists reveal how our beliefs shape financial markets, lead to expansions of credit and leverage, and expose the economy to major risks. 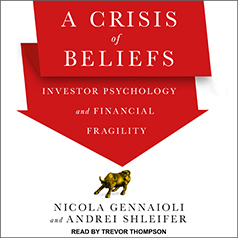 Nicola Gennaioli and Andrei Shleifer carefully walk listeners through the unraveling of Lehman Brothers and the ensuing meltdown of the U.S. financial system, and then present new evidence to illustrate the destabilizing role played by the beliefs of home buyers, investors, and regulators. Using the latest research in psychology and behavioral economics, they present a new theory of belief formation that explains why the financial crisis came as such a shock to so many people—and how financial and economic instability persist.